Portrait of Michael C. Hall, A3, approximately 20h, graphite pencils (2H to 8B). EDIT : Daily Deviation, whooa Thanks a lot Pyrogas-Sipo and Yasny-chan for the suggestion and thanks everyone for your comments and favs ! 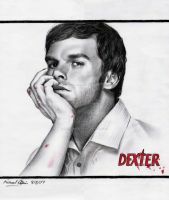 This is amazing... Love Dexter. I fall in love with your style. This is the most realistic portrait I've ever seen. When I saw this picture, I thought it was a photograph done in black and white. This deserves to be on the cover of the TV series. Excellent work! I'm absolutely blown away! You my friends are awesome! This Is Too Amazing To Be Created By A Human. I can't believe this is an illustration! Bravo. Just W-O-W. I can't believe my eyes. Incredible work!! I CAN'T BELIEVE this, the amount of work and time and everything. You're so talented. This is just the most realistic drawings i have ever seen! I look for the day i'll have this level ! The facial hair are just amazing and i was wondering if you could light me on how you did it. I have just finished to draw him in the same format as you cause I love the show too and I have to say : you inspired me with this drawing but didn't get the same perfection than you xD You're my favourite artist so far! Keep up the good work! Incredible,extraordinary work.Great character and great drawing.